A Super Mario game with Marisa Kirisame of Shrine Maiden fame. 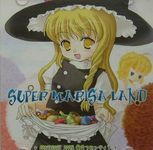 Marisa Land works with the same principles as Super Mario, but you can pick up mushrooms in several stages, going from 2-head size to 8-head size (similar to the giants in Super Paper Mario). Features Alice as an unlockable character.